L. casei, L. rhamnosus, B. infantis, B. bulgaricus, and B. longum are all species of beneficial bacteria that reside in the human digestive tract, specifically the small and large intestines. These species were chosen because of their ability to support immune health and digestive health. MAKTrek BT delivery system: aids in the advanced delivery of probiotic supplements. L. acidophilus, L. paracasei, B. bifidum and Bifidobacteria are species of beneficial bacteria that reside in the human digestive tract, primarily in the small and large intestines. These strains were chosen for their ability to support digestive and immune health. 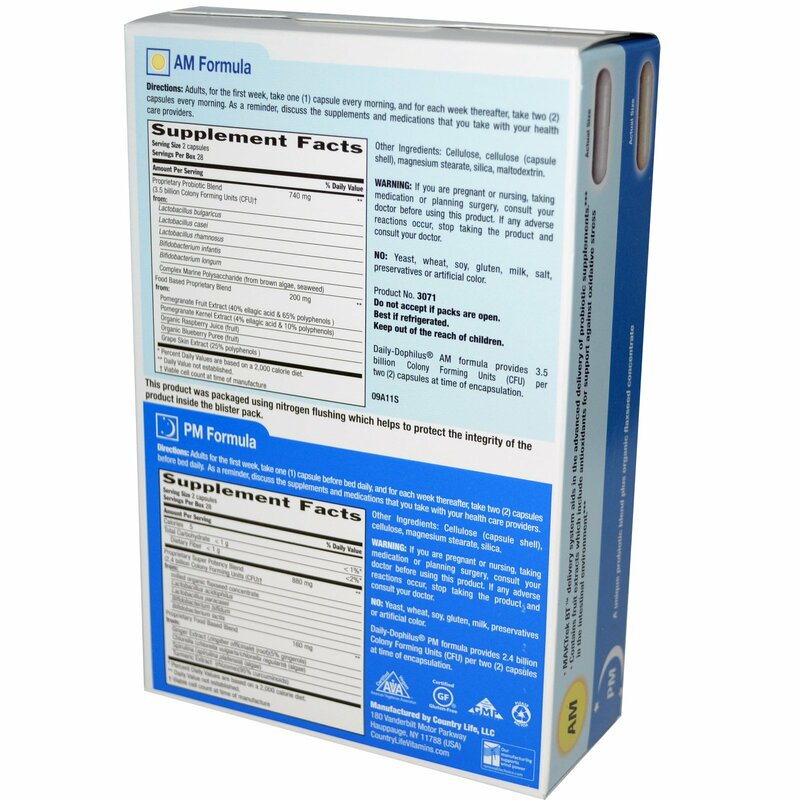 The beneficial bacteria in this formula are developed using flaxseed concentrate as the base material. Cellulose, cellulose (capsule shell), magnesium stearate, silica, maltodextrin. Daily-Dophilus AM formula provides 3.5 billion Colony Forming Units (CFU) per two (2) capsules at time of encapsulation. No: Yeast, wheat, soy, gluten, milk, starch, preservatives or artificial color. 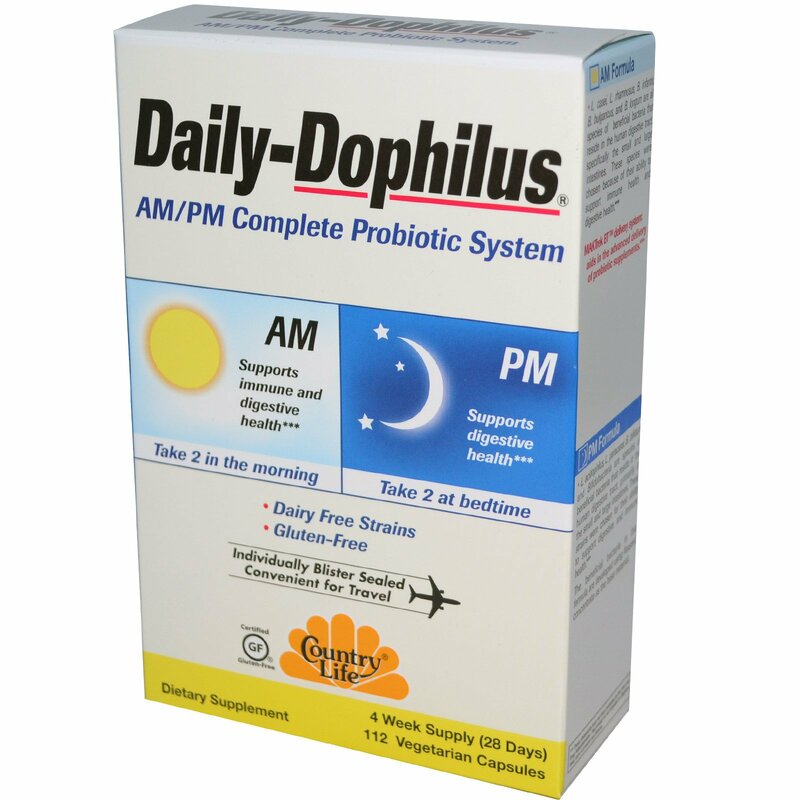 Daily-Dophilus PM formula provides 2.4 billion Colony Forming Units (CFU) per two (2) capsules at time of encapsulation. This product was packaged using nitrogen flushing which helps to protect the integrity of the product inside the blister pack. If you are pregnant or nursing, taking medication or planning surgery, consult your doctor before using this product. If adverse reactions occur, stop taking the product and consult your doctor. Do not accept if packs are open. If you are pregnant or nursing, taking medication or planning surgery, consult your doctor before using this product. If any adverse reactions occur, stop taking the product and consult your doctor.